Tiarra Haile, one of the leaders of the walkout at Hayes High School, reads a brief speech she wrote in support of the victims of the Parkland shooting. Hayes students brought signs to the event showing their support for the Parkland victims and calling for an end to school shootings. 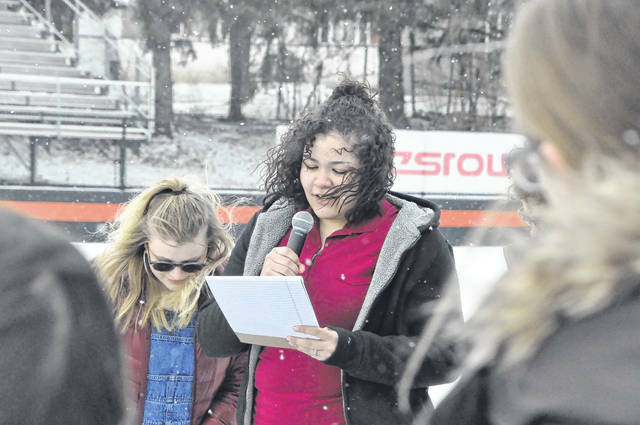 Hundreds of students at Hayes High School participated in the National School Walkout and gathered in the stadium to read the names of those killed in the Stoneman Douglas High School shooting and for a moment of silence. Students left their fourth-period classes at 9:55 a.m. and walked to the stadium at 10 a.m., where they gathered in the snow and 27-degree temperature. During the event, Caitlyn Ashley, a senior and one of the event’s organizers, read a poem she had written for the event. After the poem, the organizers of the walkout read the names of the 17 people who were killed in the Feb. 14 shooting and then held a moment of silence for those victims. After the moment of silence, Anthony Matus, a senior, urged students to register to vote when they turn 18. “Walking out makes a point, but it doesn’t actually affect legislation,” Matus said. Adryán Rojas, a junior, also wrote a letter to Ohio senators about supporting legislature that would prevent school shootings and said any student who wanted to could add their signature to it. Several students made and held signs during the event. The signs included messages of support for Parkland and calls to action to prevent further school shootings. Hayes Principal Richard Stranges said he was impressed by the students and their resolve, particularly their willingness to stand in the cold. He added no students complained to him and told him that the victims of Parkland suffered more. Stranges said he discussed the walkout with the staff at Hayes and said students shouldn’t be punished for walking out of class to participate. Mallorie Watts, a senior at Hayes, said she decided to take part in the walkout to show solidarity with the victims of Parkland and to send a message to representatives on the local, state and national level. Watts said the walkout was just the first step, and she hopes her fellow students get out and vote. Watts added she thought the walkout went well. After the event, Ashley said she wrote the poem after seeing the videos of the Parkland shooting and said she hoped her poem reached her classmates. The Associated Press reports that more than 2,000 high-school age protesters observed 17 minutes of silence while sitting on the ground with their backs turned to the White House on Wednesday as part of the national event. According to @740Walkout, the Twitter account for the event, another walkout is planned for April 20.
https://www.delgazette.com/wp-content/uploads/sites/40/2018/03/web1_DSC_1255.jpgTiarra Haile, one of the leaders of the walkout at Hayes High School, reads a brief speech she wrote in support of the victims of the Parkland shooting. 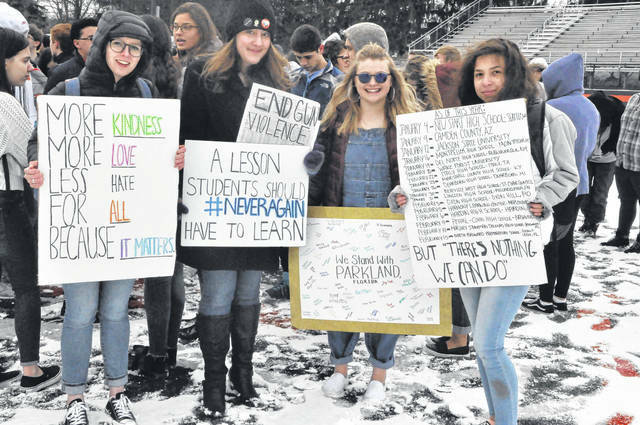 https://www.delgazette.com/wp-content/uploads/sites/40/2018/03/web1_DSC_1261.jpgHayes students brought signs to the event showing their support for the Parkland victims and calling for an end to school shootings. This entry was tagged Hayes high school. Bookmark the permalink.